2. Hawaiian ma'a (sling) with 'ala (sling stones) shaped like footballs which spin, point first, when thrown. 4. Ka'ane (strangling cord) made with eight ply braided cordage and kauila handle. 5. 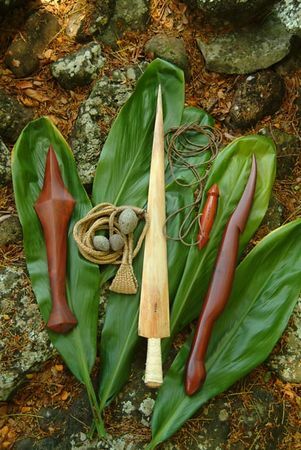 Pahoa (dagger) unique to the island of Kaua'i; made from kauila.